Despite their polarizing appeal, shrimp chips -- done right -- and mayonnaise -- made from scratch, or not -- can be great. But together? As a Dorito? Come on now. 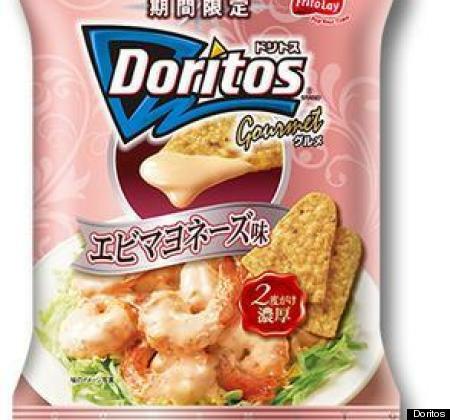 Shrimp Mayonnaise Doritos are hitting stores in Japan, United Press International reports. The limited-time-offer chips will be available until March 17. Japan is actually home to a whole range of Doritos flavors that we don't get here in the U.S., like Fried Chicken, Salty and Bacon Doritos. Some flavors -- like Avocado Cheese Doritos -- we'd love to taste, and others, we're cool hearing about from afar. Shrimp Mayonnaise Doritos may fall into the latter category. Whatever they taste like, the Pepto-Bismal-colored bag doesn't help. Frito-Lay, Doritos' parent company, released Mountain Dew Cheetos in Japan earlier this year, and the company doesn't seem to be slowing down its roll-out of bizarre flavors. What do you think is next?